Looking for a lower alcohol version of this beer? See Electric Hop Candy Jr. for a "sessionable" version. New England IPA (NEIPA for short) is a new style of beer that uses many new techniques and ingredients in special combinations to produce a surprisingly juicy beer, brimming with tropical fruit hop flavours and aromas, complimented by a smooth mouthfeel and a hazy appearance. The style showcases the softer side of hops by embracing their juiciest characteristics while downplaying bitterness. It is an incredibly drinkable beer, and over the last couple of years it's been taking the craft brewing world by storm. The birth of the New England IPA is a bit hazy (Ha! Pardon the pun). While some are claiming that breweries in Oregon were brewing it long before those in Vermont and Massachusetts, it probably began with Heady Topper, the cult beer brewed by The Alchemist. This is even though John Kimmich (owner/brewer) doesn't believe in the NEIPA style and has stated repeatedly that Heady (as the fans call it) is "just an IPA". Arguments aside, I think most would agree that Heady is at the very least one of the important missing links between American IPAs and the more recent evolutionary hazy/juicy NEIPA offspring. The insane popularity of Heady prompted long lines and unhappy patrons as the beer was often sold out. This limited supply and distribution created scarcity and huge demand for the beer. It's only natural that other brewers in the region, and eventually elsewhere, tried to imitate it. Some of the popular breweries producing the hazy NEIPA style in the US include Hill Farmstead, Trillium, Tree House, Tired Hands, Lawson's Finest, Other Half, Aslin, Monkish, Cerebral, and Fiddlehead (to name a few). The NEIPA style continued to make inroads over the years and as of this writing (Spring 2017) many of the top IPAs found on beer lists such as Beer Advocate fall under the 'New England' classification. The lack of clarity was (and to some degree still is) an incredibly polarizing topic for brewers and beer drinkers. 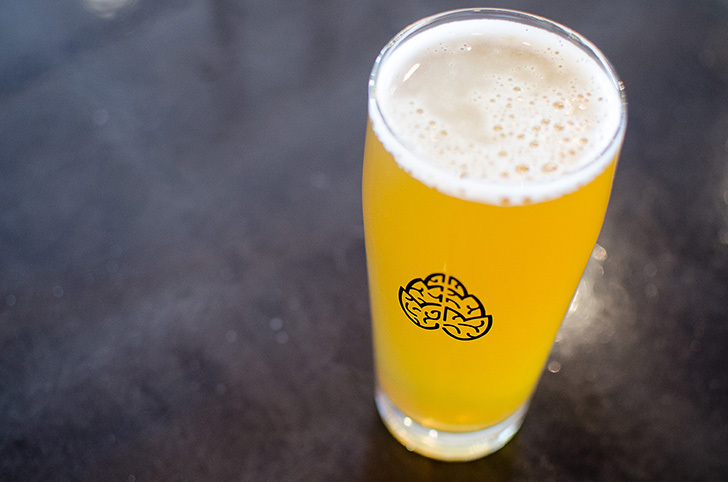 By 2015 the Brewers Association had become concerned with quality as new breweries open across the country and published a treatise titled "Beer Haze: Clarity in a Topsy-Turbid World" that broke down the various reasons for, and dangers of hazy beer. "Remember to take clarity and other visual clues as just that: clues, but not the whole truth," it concluded. "Make sure to pay attention to the beer as a complete package. Every beer fan decides for themselves what is acceptable and what is not. Understanding why your beer is cloudy will not only help you evaluate beer better, but to evaluate beer like a brewer." By fall of 2016, afraid of being labelled by one of these 'kids' in the above poll as a dinosaur brewer who can't keep up with the times, I figured it was time to brew a NEIPA. A ton of research and reading followed, during which I brewed four different beers, trying various ingredients and tweaking the process until I came up with the final product. The resulting beer is an eye opener for me, and makes me wonder why I didn't try brewing one sooner (or did I? More information below‡). I'm enjoying the beer so much I'm frankly not sure if I'll ever brew a 'standard' American IPA or Pale Ale again. Because of this I figured this beer should be labelled as another house beer and thus the name 'Electric Hop Candy' was born. 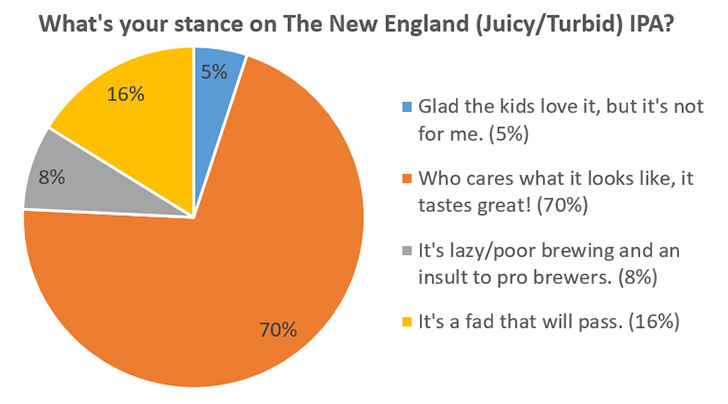 So what makes an IPA a 'New England' IPA? A large part of my research involved figuring out what needed to be done differently with an NEIPA as compared to the typical American IPAs I'm used to brewing. Some of these changes fly in the face of what was previously deemed 'common brewing practices', things I had been doing for years. 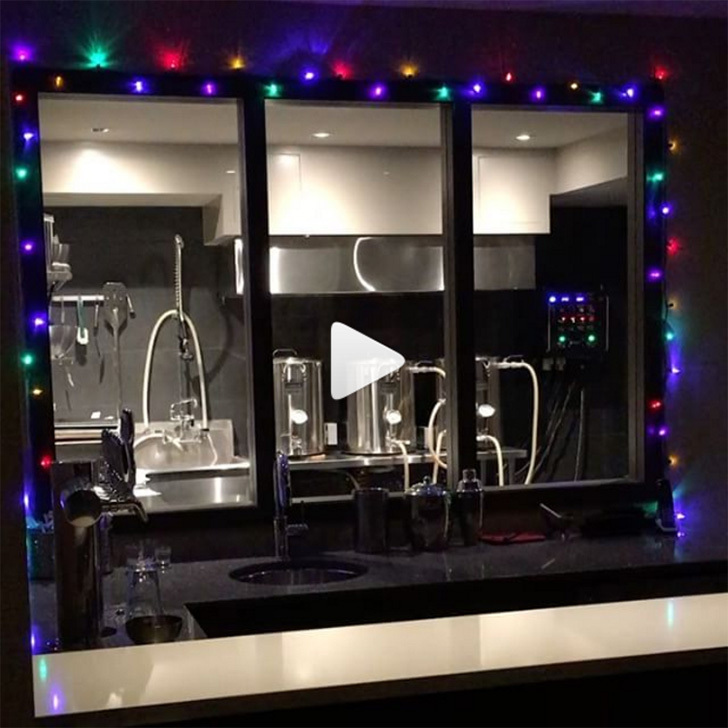 This is frankly pretty cool and shows that brewing is a vibrant, always moving hobby, with brewers constantly pushing the limits and challenging the status quo. The different processes did not pose any challenges for my setup which was nice to see. For example, doing the long hop stand held at a specific temperature is very easy with my control panel as both automatic (temperature based) and manual (duty cycle based) control are possible in the boil. One of the benefits in keeping the design flexible and allowing temperature control in the boil instead of only a manual knob. Move most of the kettle hops to late in the boil: NEIPAs are all about hop flavours instead of bitterness so the amount of early kettle hops used are restrained. In other words, avoid boiling hops a long time as the longer they are boiled, the more bitterness they add instead of flavour/aroma. This is something I've always enjoyed in my American IPAs, but NEIPAs simply push this concept further than before, almost as far as what I did in 2013 with my Electric Hop Stand Pale Ale which had zero hops in the boil. We want to limit the bitterness so most kettle hops are added first wort, and/or late in the boil, and/or steeped after the boil. Hops steeped after the boil can also contribute tannin and polyphenols which are haze contributors. 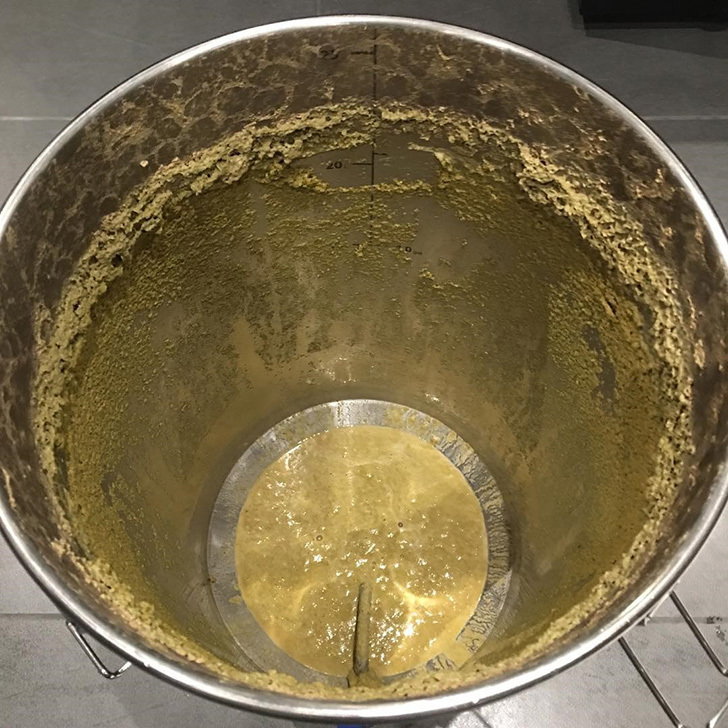 For those not familiar with the term First Wort Hopping (FWH), it's a process where hops are added to the boil kettle as the wort is being sparged from the mash/lauter tun and then left to steep for a good hour or more, releasing their volatile oils and resins. The aromatic oils are normally insoluble and tend to evaporate to a large degree during the boil. 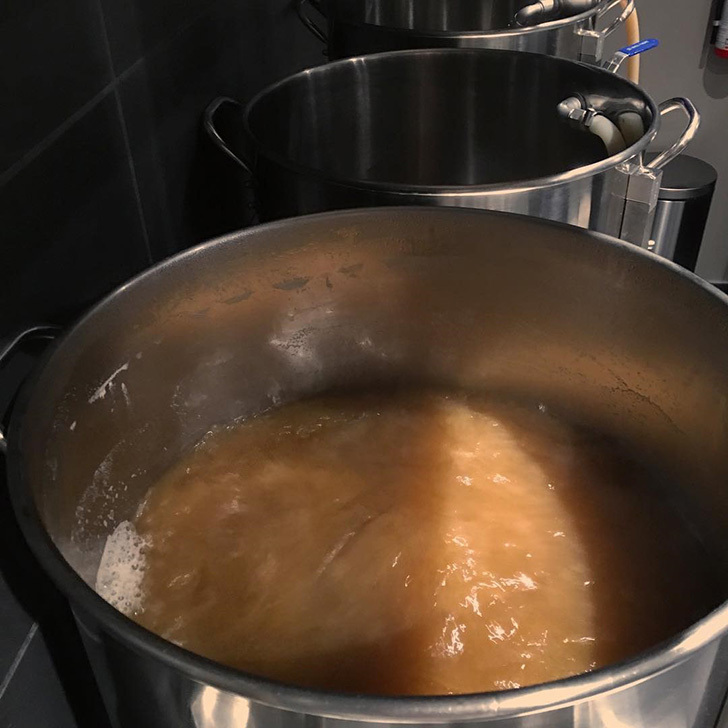 By letting the hops steep in the wort prior to the boil, the oils have more time to oxidize to more soluble compounds and a greater percentage are retained during the boil even though they boiled for the full duration. The result is a smoother bitterness. Add hops during active fermentation: Add hops at the start of fermentation or during the most active fermentation (high krausen). This is said to facilitate something called biotransformation which is basically a flavour "unlocking" of hop glycosides that we don't normally taste into aromatic/flavour compounds. In other words, it helps increase hop aroma and flavours. The science behind this isn't well understood yet. Prior to NEIPAs I had never heard of hopping during active fermentation other than at the very end as things are winding down. We were all told that adding hops during active fermentation was wasteful as CO2 would drive off the hop flavours and aromas. How times have changed! 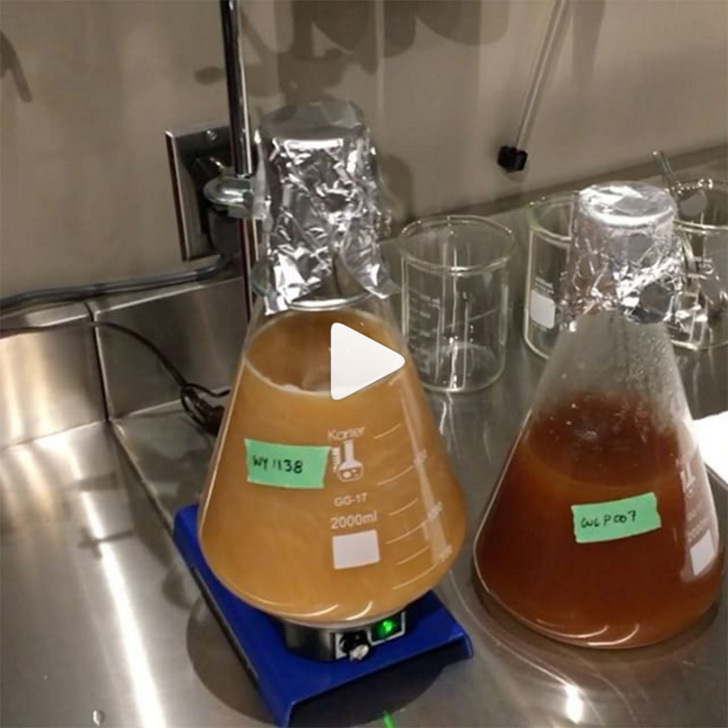 Fast forward to today and NEIPA brewers are pitching yeast and hops within a day or so of each other, and sometimes even at the same time! I usually wait a day until high krausen before adding the first round of dry hops. This is a process that is (so far) unique to the style. 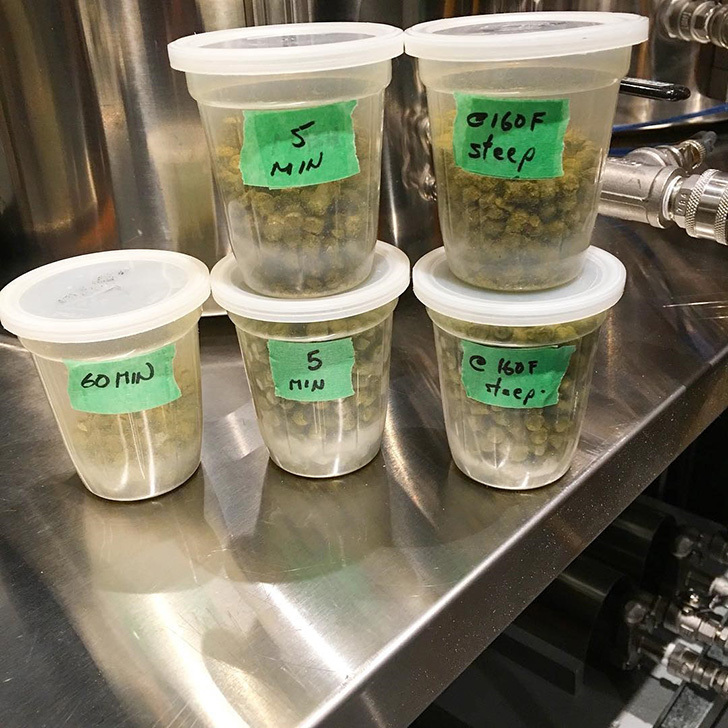 Increase the dry-hopping amounts, do multiple additions: While most NEIPAs (and plenty of IPAs) will include large doses of dry hops after fermentation is done to once again boost the hop flavours, the amount used is usually higher than normal when compared to other dry-hopped beers. Often multiple additions will be done, sometimes with short contact time (3 days or less). Increase the dosage and reduce the contact time to give a bright hop flavour. If using secondary vessels I recommend adding the hops first then purging the vessel with CO2 before racking as you really want to avoid any and all beer contact with oxygen (based on a thesis by Peter Harold Woolfe, titled, "A Study of Factors Affecting the Extraction of Flavor When Dry Hopping Beer", some oxygen is "inevitably introduced" when dry hops are added to beer "resulting from the multitude of crevices inherent to their anatomy"). I also don't recommend using hop bags or similar. Let them roam free as you'll get better hop oil extraction. To assist with this I use Hop Stopper Keg Editions when I keg. More great hints on dry hopping here. Use fruit-forward hops: Stick with hops that impart a tropical, juicy sweetness rather than the classic bitter, dank or citrus flavours you get from West Coast IPAs or American IPAs. I like Citra, Galaxy, and Mosaic. Think mango, papaya, pineapple, passionfruit, and even a bit of blueberry. Very tropical. Use a yeast that is fruity/estery: Yeast choice most definitely makes or breaks the style, so choose wisely. The right yeast can help impart or enhance the estery fruit flavours we're looking for. English yeast strains tend to work well. 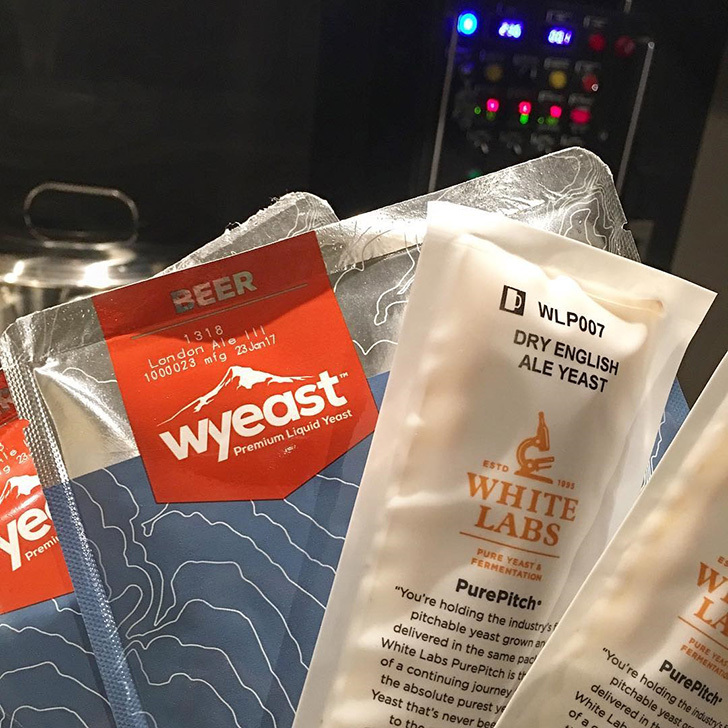 I like WY1318 London III which has become for many the go-to yeast for brewing NEIPAs. It provides the right amount of fruity esters and doesn't ferment out too dry, plus it has some of the other features we look for in a NEIPA yeast (more below). I also tried WLP007 Dry English Ale, but I find the ester profile too subdued and you have to be careful not to ferment the beer too dry. WLP095 Burlington Ale (purported to be the Conan strain used in Heady Topper) worked reasonably well too but wasn't as soft or smooth but instead produced slightly sharper hop flavours with more aroma. I preferred WY1318, though I may go back and try WLP095 again in the next batch. You don't want a neutral yeast here like the often used Chico strain (US-05, WY1056, or WLP001). I did try US-05 just for comparison sake given that it's a yeast I understand well and while the resulting beer was good, it was definitely more of an American IPA than a NEIPA. Use a yeast that aids in biotransformation: It is thought is that certain yeasts perform the previously mentioned biotransformation function better than others, basically 'unlocking' certain hop flavours that we don't normally taste. WY1318 is purported to be one of the best at doing this. Again, the science behind this is in fairly early stages and not well understood. Use a yeast that does not flocculate (settle out) well: We want some of the yeast to stay in suspension as it helps hang on to the hop oils. Oddly enough, Wyeast reports WY1318 as being a highly flocculent yeast but for whatever reason in an NEIPA this doesn't seem to be the case. High Chloride with lower Sulphate (Water Chemistry): Adjust the brewing water to increase Chloride (Cl) while keeping Sulphate (SO4) somewhat restrained. This helps create the silky smooth and rich mouthfeel. Chloride accentuates flavour by making a beer fuller bodied, rounder, and to appear sweeter. Sulphate accentuates hop bitterness/dryness. It's been common practice in IPAs to keep the level of Sulphate considerably high relative to Chloride in order to help enhance the bitterness/dryness of the hops. For example, I use a Cl:SO4 ratio of 50:275 ppm for most of my hop-forward beers but with NEIPAs I recommend 200:100 as it helps promote a smoother, less sharp, less dry bitterness. This is most definitely a process that is unique to the style. Before settling on that ratio I tried part way with 100:150 and then 150:100. It wasn't until I hit 200:100 that things started to fall into place for me. I don't recommend going much higher than 250 with Chloride as it may start to taste salty. Some say that increased Chloride also helps cause some haziness in the beer, but I cannot confirm this. Do not finish too dry: To help promote that smoother, softer mouthfeel, an NEIPA final gravity should not be too low. We don't want to dry out the beer too much as that also helps accentuates hop bitterness, something we don't want. We don't necessarily want the beer to be sweet however, so don't overdo it. Assuming a starting gravity of around 1.065 like this recipe, a final gravity of 1.015 is perfect. The choice of grains, mash temperature, and yeast all affect the final gravity. They need to be considered together. Use a base malt with flavour, limit crystal malts: Using a base malt with a bit of flavour behind it helps enhance the body and mouthfeel. I like to use Maris Otter but only at 50%, leaving the other 50% for less flavourful domestic 2-row. While crystal (unfermentable) malts should be limited, I like to use a bit of Honey malt (25L) for flavour as I find it works well here. I would stay away from high Lovibond crystal malts. 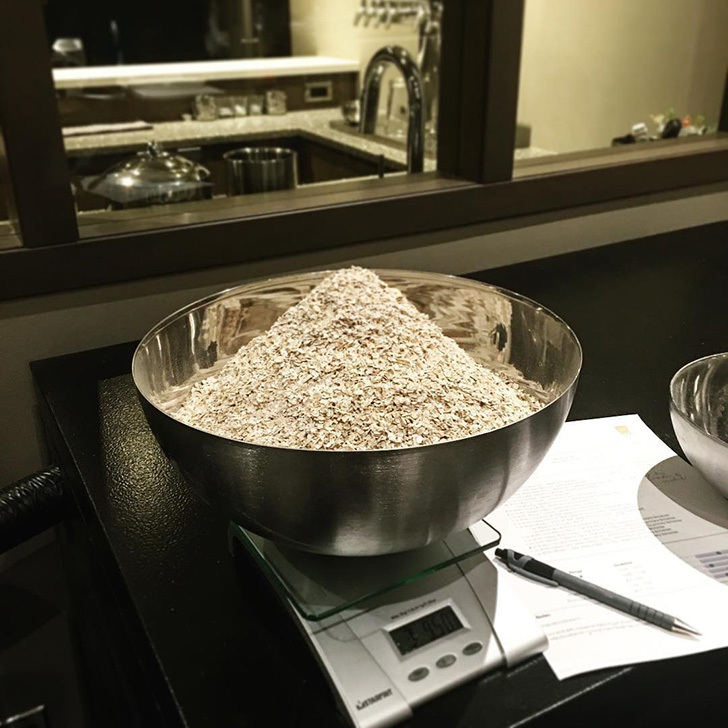 Use high-protein adjuncts: High-protein adjuncts like wheat and flaked oats help provide a silky/rich mouthfeel without increasing the final gravity and making the beer too heavy or too full bodied. Using such grains in an aggressively hopped beer that is left unfiltered also contributes to haze. How much to use? I started at 13% and kept increasing until I hit 30% which I found produced the results. Flaked barley could also be used here. Do not filter or use finings, leave the beer unpasteurized: Do not filter or use post-fermentation finings like gelatin. You want to keep as much stuff in suspension as you can as it's binding with the flavourful hop oils we want to retain. 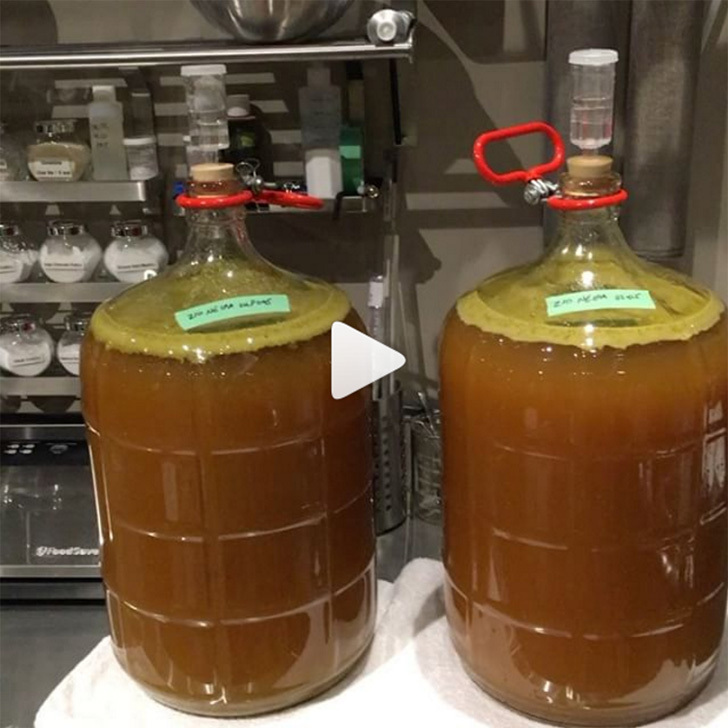 It should come as no surprise that most craft brewers (and pretty much all homebrewers) do not pasteurize their beers as it alters the taste and destroy the natural yeast and enzymes in the beers. An NEIPA should not be pasteurized. Opaque, cloudy, and occasionally turbid in appearance: This is actually not a 'must have' but I'm including it anyway. 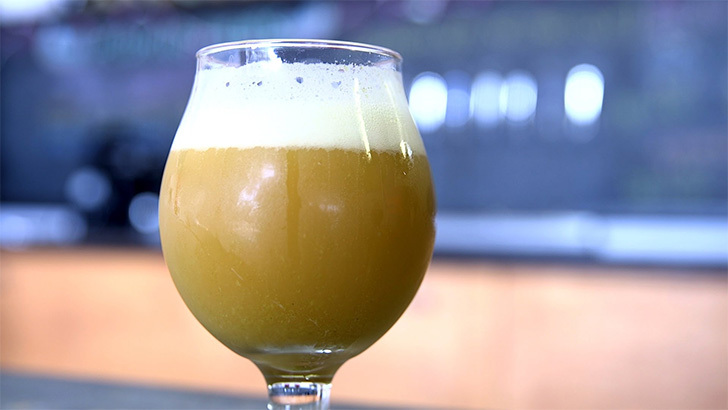 The haze is the first thing that people notice in a NEIPA, but it's actually the least important criteria and is usually not something brewers try to achieve on purpose. It's simply a by-product. The cloudiness comes primary from beer protein, the yeast in suspension, and hop-derived polyphenols. It is due to the various processes used - not because of something specific that is added to the beer (some brewers do add flour to aid with the haziness but that seems backwards to me - sorry Tired Hands Brewing!). Some permanent haze can also be attributed to the amount of hops used during dry-hopping as large amounts of dry hops can have repercussions on clarity. The moral of the story here is that you shouldn't purposely try to make a hazy beer. That's not the goal. Instead, accept that the way you make this beer will result in it most likely being hazy, and you shouldn't try and change that outcome. The main focus should be hop flavours and mouthfeel. Put all these together and the result is a unique IPA with a surprisingly soft and pillowy mouthfeel, full of juicy, fruit-forward hops flavours and aromas, with a subdued bitterness to enhance drinkability. Brilliant but hazy, as succulent as fresh tropical fruit. ‡As a side note, I find it interesting that over the years I've actually been "New England-ing" (if that's a verb) my Electric Pale Ale house beer without even realizing it. I've been tweaking the process and recipe by (1) pushing more and more hops towards the end of the boil or later with hop stands or dry hopping in order to keep the bitterness restrained but increase hop flavour, (2) increasing the amount of unfermentables to produce a smoother/silkier less dry finish, and (3) pushing the fruitiness by changing out hops that accentuate stone-fruit and tropical-fruit flavours. (The recipe for this 'New England' style Pale Ale is here). *First wort hops are added to the boil kettle at the start of sparging (before the wort is boiled). For IBU calculations, first wort hopping is said to be similar to a 20 minute addition, but I wouldn't worry about trying to figure out the IBU in this recipe. Ignore IBU calculators on beers like this where most of the hops are added late in the boil as the numbers will vary greatly depending on who's calculator you want to believe/use. In my brewing software, depending on which curve I use the beer's IBU will vary from 11 to 68. Useless! **For hints on how to make a starter see Chapter 6 of How to Brew and Appendix A of Brewing Classic Styles. Also see the stirplate/starter equipment I use. (Higher Chloride and lower Sulphate as compared to what is normally done with most American IPAs. This helps create the silky smooth and rich mouthfeel, pushing the hop flavours to be rounded and less sharp/dry). Single infusion mash at 152F for 90 mins. While normal mash pH is typically 5.2-5.4 (when measured at mash temperature) you may want to aim on the higher end of this range to get a beer that is rounder/more full instead of sharp. Raise to 168F mashout temperature and hold for 10 mins. ~90 min fly sparge with ~6.0 pH water (measured at mash temperature). At start of sparge add First Wort Hops to the boil kettle to let them steep as the wort is collected. Collect 13.9 gallons. Boil for 60 minutes, adding Whirlfloc and hops per schedule at 15 and 5 minutes left. 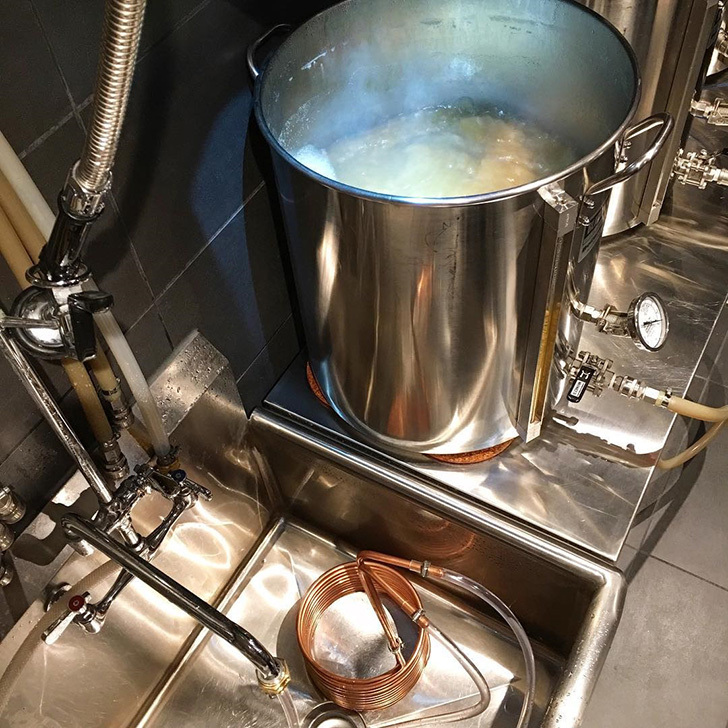 Once boil is completed, quickly chill the wort to 180F (a copper immersion chiller works well - even the cheapest 25' x 3/8" immersion chiller will only take 2-3 minutes to chill from 212F to 180F). On the control panel, switch the BOIL PID to AUTO mode and set the temperature to 180F. This will hold the wort at 180F. Do not worry if you undershot the 180F target temperature slightly when chilling with the immersion chiller. The control panel will quickly raise the temperature back to 180F and hold. Add the steeping hops, put on the kettle lid, and wait 30 minutes. There is no need to stir the wort during this time. 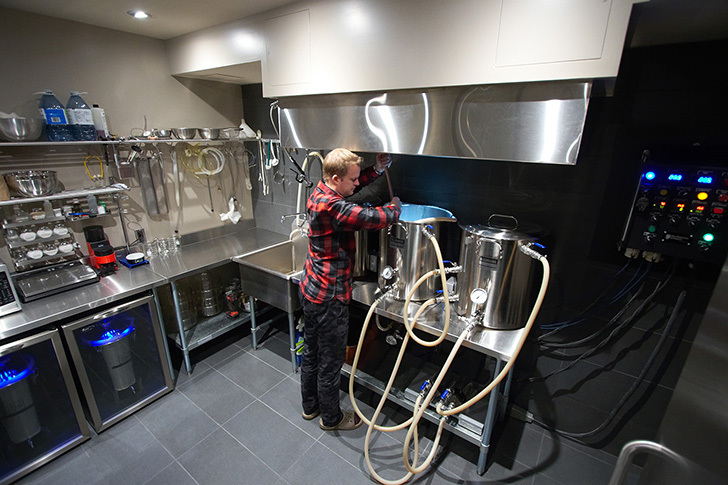 The control panel will fire the heating element periodically to maintain the 180F temperature which also gently stirs the wort through convection currents. After the 30 minute steep turn off the heating element and chill the wort quickly to 66F (I use a CFC). Aerate well. Pure oxygen from a tank may be used at a rate of 1 litre per minute for 60 seconds. Pitch yeast and ferment at 68F (wort temperature). I use stainless fermenting buckets in wine fridges. Assuming you did not underpitch the yeast, after 24 hours you should be at high krausen (highest point of foaming). Add dry hops #1 directly to the fermenter. Continue to ferment at 68F (wort temperature) until at approximately 1.020 (5 points from final gravity) and then raise the temperature to 70-72F until finished. In my case I simply turn off the fermenting fridges and allow the wort to temperature to naturally rise to room temperature. Fermentation should be complete in about 7-8 days total. Add dry hops #2 to brite tanks (I like to use two 5 gallon glass carboys), purge with CO2 to avoid oxygen pickup, then carefully rack in the beer on top of the hops. Do not use finings such as gelatin. I also recommend not using hop sacks or other containers as you'll get the best flavour extraction from the hops if you let them roam free. After 3 days in the brite tanks package as you would normally. I rack to CO2 purged kegs and carbonate on the low side (around 2 volumes of CO2) to minimize carbonic bite and let the fruity hop and subtle malt flavours shine through. 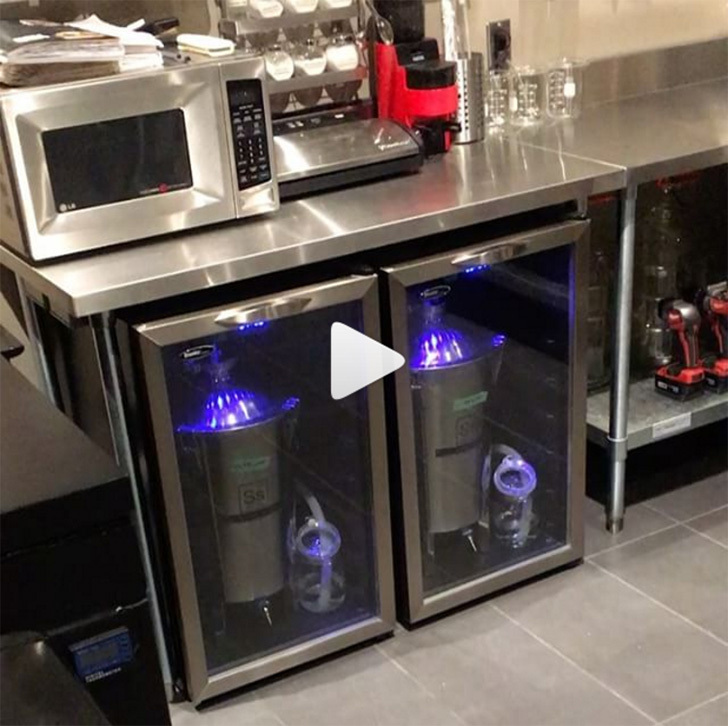 I chill the kegs to near freezing while carbonating at the same time in a 6-keg conditioning fridge. After ~1-2 weeks the kegs will be carbonated and ready to serve. Like all hop forward beers this NEIPA is best consumed fresh and young so feel free to raise the CO2 pressure temporarily to 30-40 PSI to carbonate fast over a 24 period, and then turn back down to serving pressure. 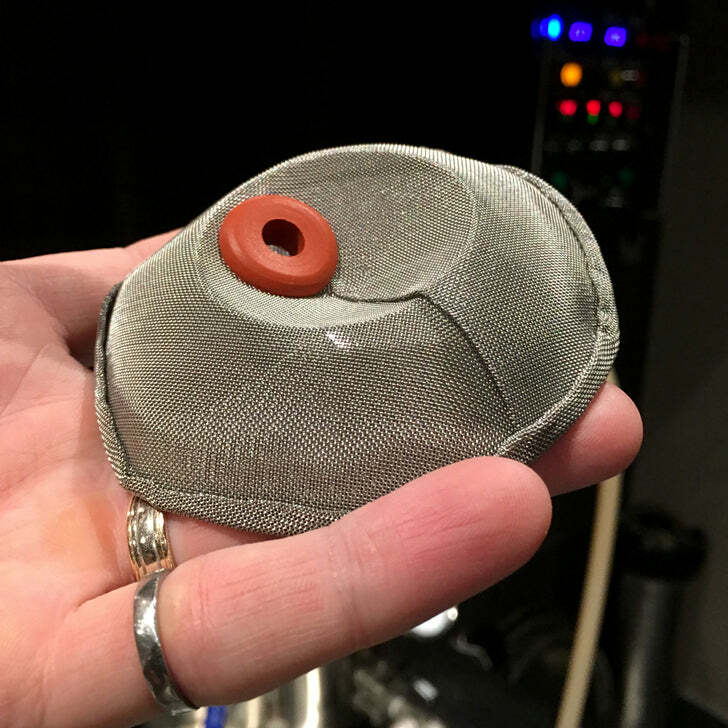 Some hop bits will invariably make their way into the keg so I use a Hop Stopper Keg Edition filter on the end of the keg's liquid out dip tube to ensure that hops do not clog the dip tube and/or end up in the glass. Try your hand at this softer, rounder, juicier IPA - brew Electric Hop Candy today! Enjoy! Looks awesome; gonna give it a go real soon. Great work on the writeup and the research. Thanks Jason! After all that writing, I think it's time for a pint. I can't wait to try this. The best beer I ever brewed was based on the HBT Heady Topper clone thread. This sounds like a real treat. Kal- question for you on brewing salt additions. 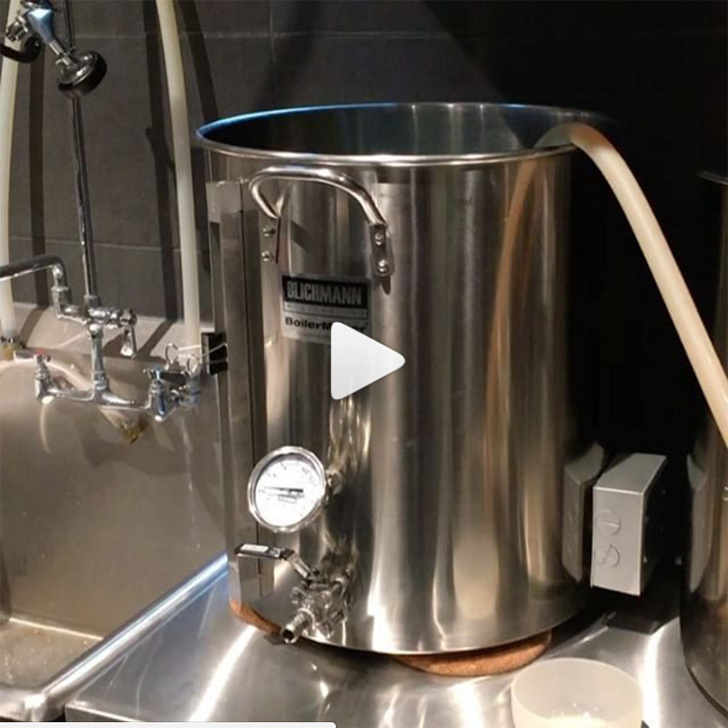 EZ Calc specifies separate mash and sparge additions. How do you handle this when fly sparging? What's your protocol? I use ez water calculator as well - it'll tell you how much to add to the mash and how much to add to the boil (that's what I do). Good luck! Excellent write up Kal, will be brewing up this one soon! Appreciate the quality info that went into this! Thanks John! I have to say I did enjoy the research. I find it's a fun part of brewing for me. If anyone has any comments or corrections let me know too! Order a minimum of 8 oz. 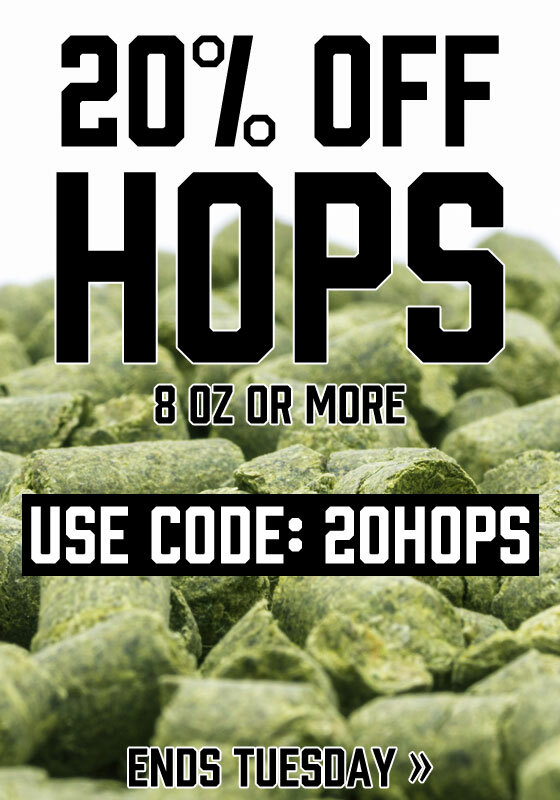 of hops, and get 20% OFF! Just use the Promo Code: 20HOPS at checkout. Also available towards bulk 1 lb. hop pellets AND 1 lb. leaf hops. DEAL ENDS TUESDAY MARCH 14th! 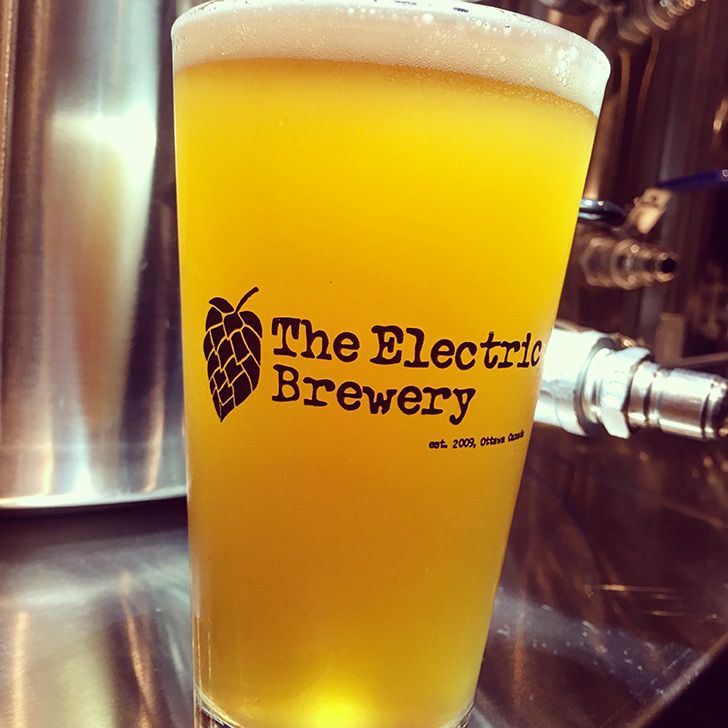 Note: All 3 hops used in our new Electric Hop Candy New England IPA are in stock and shipping! Cant wait to try it Kal! I brewed the Citra Double IPA on Sunday. Good stuff, Kal! Great article, thanks for the time and research! I see you have Whirlfloc in the recipe - can you comment on its role for this style? I think some people really enjoy the hazy appearance, though I fully get the debate on this subject. I personally like the OJ appearance with the juicy taste. I don't know if Whirlfloc would even make of a difference in the appearance given the polyphenols from the hops. I left it out of my recent recipe. It's cheap and likely wouldn't matter, but just curious on your thoughts there. kal, how much Cl and SO4 is needed to achieve a ratio of 200:100 ppm per 1 gallon of RO water? Not sure! I would recommend using EZWaterCalculator (it's free) to figure that out. Good luck! I leave out gelatin before packaging but use whirlfloc in the kettle. I figured you want to leave behind kettle trub and get clear wort into the fermentor. I don't want all the extra hop oils I'm adding later via dry hopping to fall out / stick to the trub that's going to get left behind. Kal, this looks great, been wanting to try heady topper but impossible to find out here on the west coast. My question is why use an immersion chiller to bring the post boil wort down to 180 instead of your counterflow and recirculating? Are you just concerned about hot side aeration? No - I use a Hop Stopper which isn't meant for recirculating setups. It does such a good job at keeping break material out of the fermenter that it'll clog if you try and recirculate continuously. It's meant for 1-pass use. So I use a cheap immersion chiller to bring the wort temp down from 212 to 180F in about 2-3 mins, then do the hop stand, then use the counterflow/Hop Stopper into the fermenter. Oh, completely forgot about the hop blocker. Makes perfect sense. Yup, though that said, chilling / recirculating through it for only a couple of minutes would probably be fine. I just didn't want to take any chances. How do you keep from sucking up hops from 2nd into keg? Kal - Judging by the pics, I guess you add the dry hops naked in the fermenter - you don't use a hops screen canister or something similar?